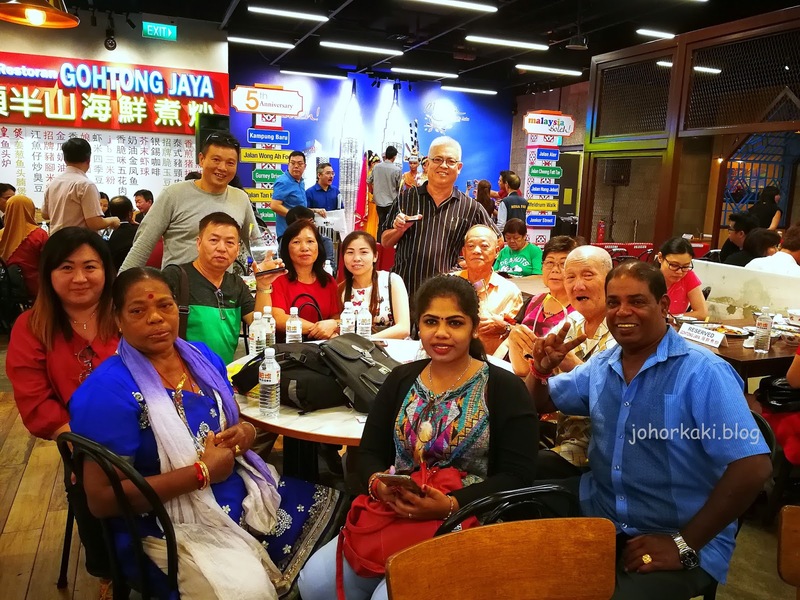 Folks in Singapore love Malaysian food. That's beyond doubt - just look at the numerous Malaysian food stalls everywhere, all over our sunny island. Five years ago, Malaysia Boleh! came up with the great idea of having food from Penang, Kuala Lumpur, Ipoh, Johor Bahru etc all under one roof. Founders of Malaysia Boleh! Mun and Leng travelled all over Malaysia to look for good hawkers and learned their craft from them. Mun and Leng also convinced them to bring their food to Malaysian Boleh! food court in Jurong Point shopping centre in Singapore (Boon Lay MRT station). Malaysia Boleh! was a huge success right from the start because that is exactly what many Singaporeans want. Malaysia Boleh! held a big celebration on 5 Oct 2017. There were many things to celebrate. Malaysia Boleh! is now expanded to double the original size - from 17 food stalls to 32 stalls now. With Malaysia Boleh! 2, there are now a lot more seats to cater comfortably to more customers. The Malaysia High Commission in Singapore joined in Malaysia Boleh! 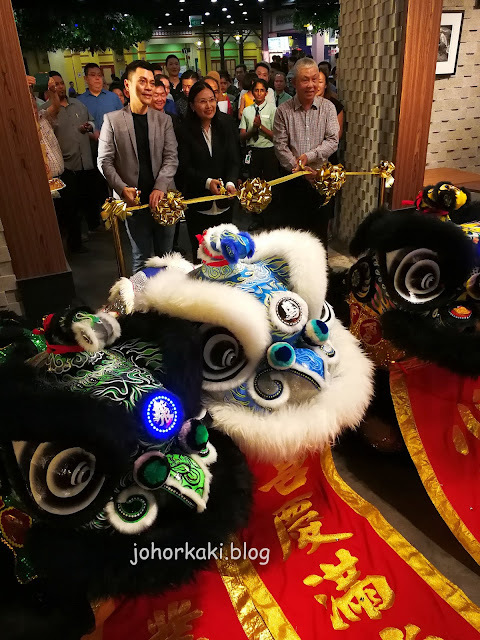 Fifth Anniversary and expansion celebrations as the food court is a partner of Tourism Malaysia. The golden arch between Malaysia Boleh! 1 and Malaysia Boleh! 2. 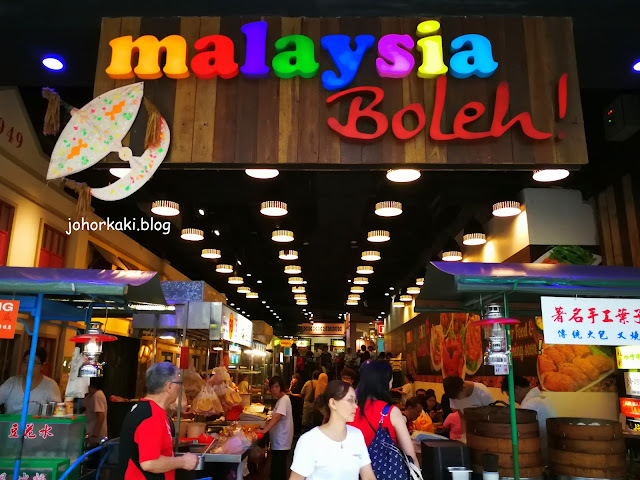 Let's take a walk around the expanded Malaysia Boleh! 2 food court. Malaysia Boleh! now has a full menu zhi char stall staffed by chefs from Gohtong Jaya in Genting Highlands. This is probably the only zhi char stall in Singapore inside a shopping centre food court. Wok hei is hard to find in Singapore. This hor fun from the Gohtong Jaya zhi char stall clearly has it. They even have San Lou Bee Hoon 三樓米粉 which is rice vermicelli fried to a slightly charred crisp outside while inside the bee hoon is still moist with sweet savoury seafood stock. This is an iconic dish from Johor Bahru. A new stall serving braised duck from Skudai, Johor. 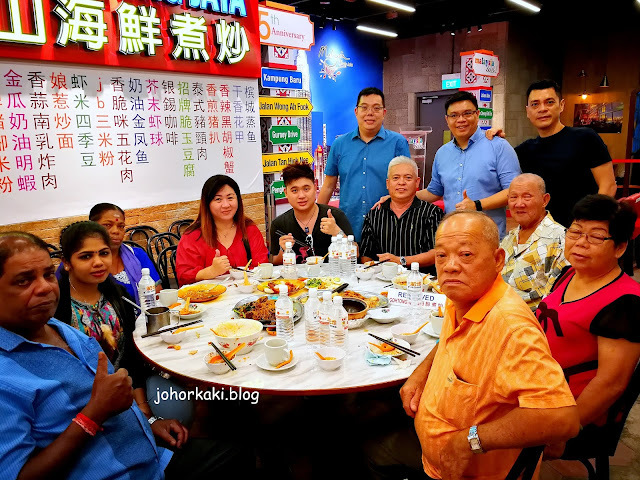 For the first time in Singapore, a kway teow kia stall serving kway chap the Johor way i.e. with narrow rice noodles instead of rice sheets (the Singapore way). Penang Fried Carrot Cake. Made with white radish and rice flour, this carrot cake is softer than the Singapore version. This crispy yet tenderly juicy fried chicken wing from the nasi lemak stall is nice! Mee Rebus by a stall originally from Kuantan. Sweet Potato Cakes. I don't know where to get these mildly sweet traditional spongy steamed cakes in Singapore, other than at Malaysia Boleh! They have added a Chili Pan Mee stall from Damansara in KL. It is one of the stalls where there is always a long queue. There is a colourful Nyonya kueh stall now. 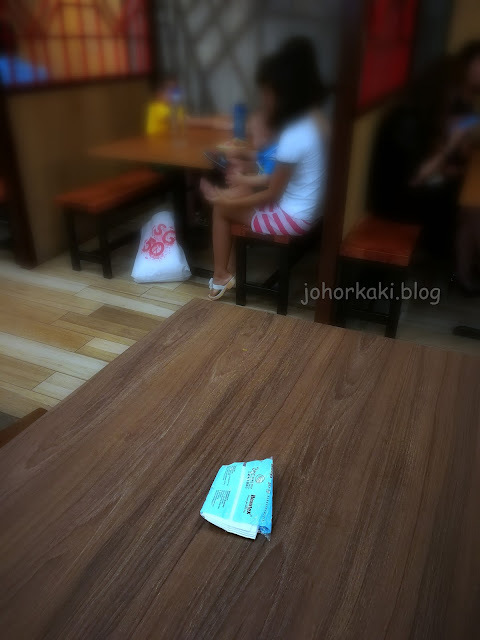 Hey, there are still the stalls from Malaysia Boleh! 1 food court which are still going strong with their loyal following. Penang Hokkien Mee which folks in Singapore call prawn mee. Very few places in Singapore serve the Penang version of Hokkien mee which is yellow noodles in a robust savoury spicy stock of prawn heads and sambal chili. The dish is generously topped with lean pork slices, pork ribs, prawns and egg. I like the Penang Char Kway Teow at Malaysia Boleh! Though not so big on wok hei (there is a bit), the savoury sauce, lard and big prawns are just the way they are in Penang. I love the aroma of caramelised soya sauce from this Penang char kway teow. The oysters at their Penang Orh Chien (fried oyster omelette) stall are huge. KL style Hokkien Mee. Robust sauce and lard flavours, this one. The Ipoh chicken rice and chicken hor fun stall. When you are at Malaysia Boleh! you will see QR codes on all the stall windows. Scan the QR code with your handphone - it will take you to the Tourism Malaysia webpage on interesting destinations. Crispy cracker with large prawns at the Penang pasembur or Indian rojak stall. Penang Road Chendol. A nice cool sweet dessert everybody loves. These are just a handful of the 32 stalls at Malaysia Boleh! food court. You have to come here and find out for yourself. 👉Malaysia Boleh! food court today. This comfortable place really got the feel of being in Malaysia. The crowds, the vibes and buzz, the aroma of caramelised soy sauce, and the tastes of familiar dishes from Penang, Ipoh, Kuala Lumpur, Kuantan, Johor Bahru and more. I am the sure the Malaysia Boleh! team is looking to add more to the list.